Western Digital's $4.3 billion acquisition of Hitachi Global Storage Technologies will boost the hard drive maker's enterprise presence. IRVINE, Calif. ( TheStreet) -- Western Digital's ( WDC - Get Report) $4.3 billion acquisition of Hitachi Global Storage Technologies will significantly boost the hard drive maker's enterprise presence, according to analysts. "I think it's a really great move," said Greg Schulz, senior adviser at analyst firm Server and StorageIO Group. "It gives Western Digital a higher-end drive -- they have never really been perceived as an enterprise player." Western Digital is buying Hitachi Global Storage Technologies for $4.3 billion. "Western Digital didn't really play in the enterprise segment, which has better gross margins," Kaushik Roy, an analyst at Wedbush Morgan, told TheStreet. "If you buy Hitachi, you're becoming an instant player in the big enterprise segment -- also, Hitachi has a joint venture with Intel ( INTC where they are making solid state disks (SSDs) -- this also gives Western Digital access to those assets." Investors are equally bullish on the deal, which is expected to close in the third quarter. 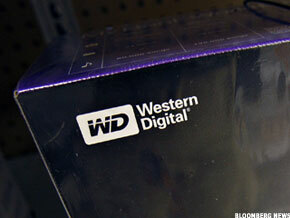 Western Digital's shares were soaring more than 13% at midday Monday, up $4.11 to $34.12. "We now have opportunity to realize a series of very significant long-term benefits for our shareholders," said John Coyne, Western Digital's CEO, in a conference call before market open. "This is a unique development -- it combines the resources of two of the world's most profitable hard-drive companies." In addition to Hitachi GST's presence in enterprise storage, Western Digital is also gaining the Japanese firm's manufacturing plants in China and the Philippines. " This will provide us with our first manufacturing facilities in these key markets," said Wolfgang Nickl, Western Digital's CFO, during the conference call. Western Digital expects to grow its gross margin by 100 basis points to between 19% and 24% once the deal is completed, he added. The hard drive maker, which competes with Seagate ( STX - Get Report), Samsung and Toshiba, also said that Western Digital and Hitachi GST brought in total revenue of $4 billion during the recent December quarter. It is not just Western Digital, however, that stands to benefit from the Hitachi deal. Wedbush Morgan's Roy told TheStreet that the acquisition also bodes well for rival Seagate. "When you have industry consolidation, there's less likelihood that pricing will be as cutthroat," he said. "If pricing is less cutthroat, then gross margins should be better, not just for Western Digital, but also for Seagate." Seagate shares were also on an uptick Monday, surging more than 9% to $13.55. Western Digital warned, however, that companies often lose market share around major M&A deals, although Coyne vowed to minimize this possibility. "It's our intent to work very hard now and in the future to deliver significant value to customers," he said. The Irvine, Calif.-based firm is on a roll at the moment, buoyed by healthy demand for storage hardware. The company recently trounced Wall Street's estimate in its fiscal second-quarter results as hard-drive shipments increased nearly 3% sequentially.